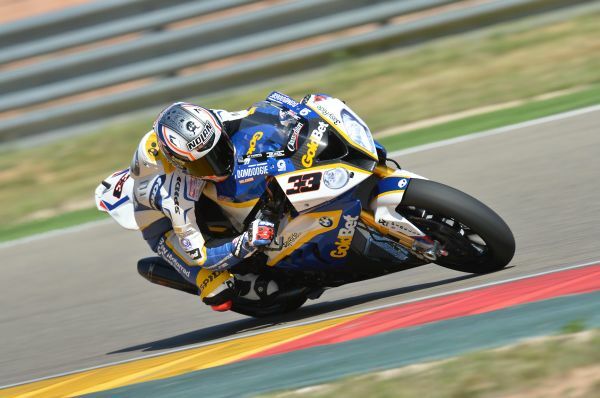 BMW Motorrad GoldBet SBK Team is back on winning ways. 12.05.2013: BMW Motorrad GoldBet SBK Team - WSBK - Monza - Races Weather conditions: Sunny. Factory rider Marco Melandri (ITA) rode his BMW S 1000 RR to victory in race one today and in race two, Marco was once again one of the front runners and finished second, claiming the fastest race lap. His team-mate Chaz Davies (GBR) finished fifth in the first race, but crashed out of race two, once again, lying in fifth. The “Autodromo Nazionale di Monza” hosted the fourth round of the 2013 FIM Superbike World Championship. In the Riders’ Classification, Marco climbed to fourth with 96 points. Chaz is fifth with 94 points. In the Manufacturers' classification, BMW lies in second with 144 points. Race one, which was recorded as the fastest average speed World Superbike race ever, was a breathtaking thriller from the start flag until the finish line. Marco, who started from fifth, pushed forward from the word go and took second position on lap two. Until the chequered flag, he fought an exciting battle with Eugene Laverty (IRL), Sylvain Guintoli (FRA) and Tom Sykes (GBR). Positions between the four changed all the time. On lap 11, Marco took the lead but slipped back to third on lap 15. The battle continued and reached its climax on the final lap. Marco took the lead but lost it a few corners later, however he did not give up the fight. With a brilliant manoeuvre he regained first place with only a few hundred metres to go and defended his lead until the chequered flag. In a photo finish, he had an advantage of just 0.085 seconds to Sykes in second place and 0.107 seconds to Laverty in third. Chaz, who started from ninth, also gained several positions in the early stages of the race. He was involved in a battle with Jonathan Rea (GBR) and Davide Giugliano (ITA) and soon took fifth place, a position he successfully kept until the finish of the race. Race two saw the same four protagonists, but this time the quartet did not change positions as much, they instead seemed to wait for the closing stages to start their final battle for victory. Marco was in third place for the majority of the race, and on the penultimate lap he started his charge forward and overtook Guintoli for second place. Laverty however defended his lead up until the finish line, winning the race with an advantage of 0.143 seconds ahead of Marco. Chaz had a more difficult race than race one. In the early stages, he again improved to fifth, but then went wide in the chicane and dropped back to eighth. The Welshman fought his way back to fifth, but a crash on lap 12 ended his hopes of another top result. The BMW Motorrad GoldBet STK Team had a more than unlucky day. The race of the FIM Superstock 1000 Cup ended prematurely for both riders after Sylvain Barrier (FRA) and Greg Gildenhuys (RSA) were involved in a heavy crash in the first corner which involved a number of motorcycles. Both had to be taken to the Medical Centre to be assessed. Sylvain luckily escaped unhurt, Greg was suspected to have fractured his right leg, but further examinations showed that he fortunately just twisted his ankle. “It was an unbelievable day for me. To finish first and second here in Monza is just awesome and it feels great after we had a difficult start to the season. Race one was unbelievable. I knew that my race pace was quite good, even if we struggled a bit in qualifying. When we started, I knew that it would be very tough until the last corner. When Eugene passed me on the last lap, I thought it would be impossible to pass him back again, because he was very good in the turns and he was pulling away. But in the last corner I was quite close, I knew that I could go a little bit faster than the others and so I overtook him and, even though I was a little bit wide, I kept full throttle until the finish line. Until the chequered flag, I was talking to my RR, telling her ‘go, go, go’ – that was incredible. In the middle of race two I was a little bit faster than the two guys in front of me, but I could not try to pass. But when Sylvain made a little mistake, I overtook him and then tried to catch Eugene, but he was a bit too far away. Anyway, I was also very happy with second place. “Race one was a fun race but not ideal. It was fun to battle with Jonathan and Davide, but there is no need to fight around here because the front group goes away too quickly and you lose everything, especially in the slipstream which is very important. You have to take a few tenths every lap in the slipstream. I was quite happy with my pace in the middle of the race, I could see that I was closing a little bit on the front group but in the end it was not possible to catch them. I would have liked to see how the race would have ended if I would have been able to go with them. In race two I lost time fighting with Davide again. “After a dramatic weekend in Assen we came to Monza with many new ideas for Marco, ideas that have worked well since Friday. Thanks to the work the race and R&D team have done after Assen, as Marco feels comfortable and is able to show his talent. In both races he was perfect in terms of performance and race management. We’re really happy he finally got back the right feeling with the bike, which allows him to go as fast as he did here in Monza. Now we have to keep up this level of performance for the future races. We have many ideas so we are really confident. I want to thank his crew for their work in Saturday’s Superpole, as they did a perfect job in a short amount of time and allowed him to compete the session, so well done. Unfortunately, because of the crash on Friday, Chaz started to work on the settings later. The set-up was defined today after race one. Chaz is aware of his capability and power, and it showed in race two when he tried to close the gap to the front riders to fight for the win but unfortunately he crashed. We have to appreciate the consciousness and commitment he showed. In race one he gained a fifth place which is important for gaining points towards the championship. The championship is still long, so we have to keep working. “In Monza we were finally rewarded for all the hard work we have done with Marco. We have lost races due to some unlucky situations and small technical issues. All the guys have been working very hard and it was obvious from the first practice session here in Monza that Marco was confident with his bike. It was great to see him smile again. Today’s two races confirmed what we had seen since Friday and we are all happy. We must congratulate him and his crew for their work. We have seen that our RR is quite competitive on this track, even if, as we expected, our competitors are very strong. For Chaz, it was not an easy weekend. He had a crash on Friday but then working with his crew he improved his feeling for the bike step by step. Even if his starting position was not the best, he was catching up, especially in race two. In the middle of the race he was really fast but unfortunately he hit the bumps with the front and lost the opportunity to fight with the top group. BMW Motorrad commitment to the Superbike World Championship 2013.